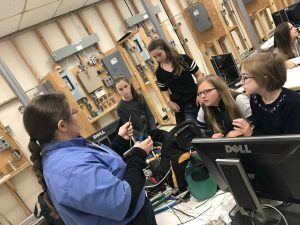 More than 400 Grade 7/8 students and their teachers participated in the first-ever Women in Trades Event at St. Lawrence College in October 2018. The event allowed students to experience an exciting, enriching and cutting-edge day of presentations and workshops led by a diverse group of professionals and inspiring young teaching female tradespersons. The training day provided students with engaging hands-on learning that includes learning employable skills and about future careers. In addition to teaching the importance of had skills, presenters also drove home the importance of promoting inclusion and respect for everyone, no matter their gender or pathway. Check out a series of videos from the Women in Trades event.